1. What percent of the total country’s wealth do you think the richest 20% of the population hold? 2. 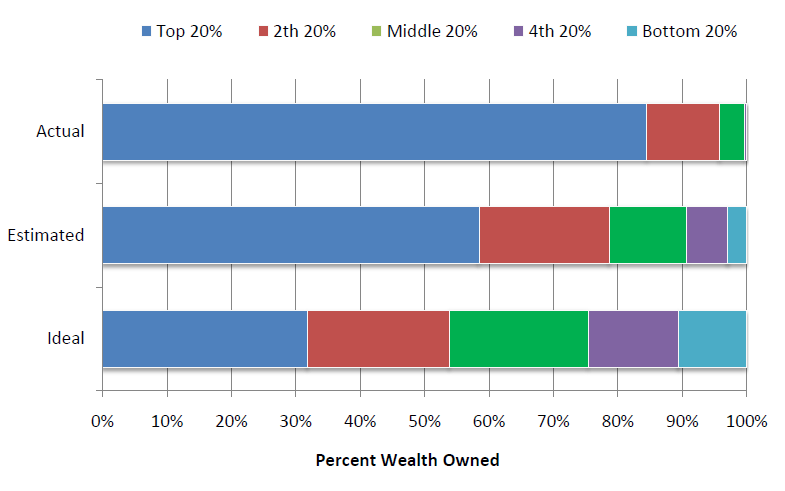 What percent of the wealth *should* they hold? 3. How do you feel about taxes? 4. What percent of taxes is too much? Too little? 5. How do you feel about government services like jien bao or the CDC? 7. What might be some hidden costs to having high taxes? Country A has very high taxes and services for everything a citizen needs, including free education, free healthcare, help with paying living costs for students and elderly, free job training, roads and physical infrastructure, communications infrastructure all paid for and cared for, all the basic necessities of modern life are provided by the government. Country B has very low taxes, especially for rich people, and nearly no services, except for roads and infrastructure, border control and military defence. Everything else is provided by private companies, if you want it you pay for it out of your own pocket. If you don't want it, you don't have to pay for it. Americans generally underestimate the degree of income inequality in the United States, and if given a choice, they would distribute wealth in a similar way to the social democracies of Scandinavia, a new study finds. Recent analyses have shown that income inequality in the US has grown steadily for the past three decades and reached its highest level on record, exceeding even the large disparities seen in the 1920s, before the Great Depression. Norton and Ariely estimate that the one percent wealthiest Americans hold nearly 50 percent of the country's wealth, while the richest 20 percent hold 84 percent of the wealth. But in their study, the authors found Americans generally underestimate the income disparity. When asked to estimate, respondents on average estimated that the top 20 percent have 59 percent of the wealth (as opposed to the real number, 84 percent). And when asked to choose how much the top 20 percent should have, on average respondents said 32 percent -- a number similar to the wealth distribution seen in Sweden. "What is most striking" about the results, argue the authors, is that they show "more consensus than disagreement among ... different demographic groups. 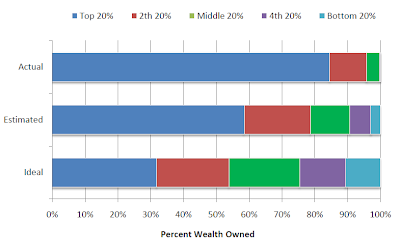 All groups – even the wealthiest respondents – desired a more equal distribution of wealth than what they estimated the current United States level to be, while all groups also desired some inequality – even the poorest respondents." The study also offers the information in this graph by by the respondents' income levels, by their voting habits and by gender. It turns out that men prefer a slightly more unequal wealth distribution than women but the differences are slight. And nobody prefers as much wealth inequality as the US currently has! This is all quite astonishing. What's probably most astonishing is that nobody much seems to have cared to remove the ignorance these findings suggest. Americans' ignorance about wealth (and, probably, income) distribution is encouraging in the sense that it offers hope that most voters might opt for government policies more conducive to equality if only they knew how unequal things were. But it's dismaying in the sense that people who occupy a position of relative privilege seem to go out of their way to avoid acknowledging it. A recent example is M. Todd Henderson, a law professor at the University of Chicago whose annual household income exceeds $250,000, putting him comfortably ahead of 98 percent of his fellow Americans. Henderson was foolish enough to write a blog post venturing that even though he and his wife earn more than $250,000, his Hyde Park neighbor Barack Obama shouldn't raise his taxes because "we can't afford it" after paying the mortgage, the kids' private school tuition, the nanny, etc. You can imagine the response he got. I would have thought all this would be an obvious weapon for the Democrats to use when defending the Health Care Reform, for example, or the minimum wage or umpteen other possible political acts. But no.